The Diversity & Inclusion Center announces a strategic partnership with Dr. Jamison Green to educate organizations about transgender issues in the workplace through a unique blended-learning approach. Dr. Green is recognized worldwide for his contributions to transgender health, civil rights, social safety, dignity and respect for gender-nonconforming people. Google Ventures provides an excellent hour-long video resource on Unconscious Bias focused on gender bias at work. https://www.youtube.com/watch? Congratulations to Dr. Sondra Thiederman on her newest handbook, 3 Keys to Defeating Unconscious Bias. To learn more, visit https://thiederman.com/. Good intentions are not enough to overcome unconscious bias. Whether we are aware of it or not, the unconscious brain is influencing our perceptions and our behavior. Neuroscience is now revealing that when it comes to dealing with differences, the brain has unconscious, built-in preferences for what is familiar and already known and will move away from differences that are not familiar or comfortable. When it comes to inclusion, the brain can work against us. Brain imaging studies show that simply viewing a photograph of another person can cause different areas of the brain to light up. When a person in a photograph looks more like us, there is increased activity in the reward center – the “feel good” center – of the brain. If the person in a photograph looks very different from us, there is either no reward center activity, or the brain area associated with fear and threats becomes more active. It’s inherently human to move toward reward and away from threats and fear. Biases are a natural part of the brain’s operating system. In fact, the brain is a bias-making machine, and no amount of self-reflection will uncover all of our unconscious biases, preferences or expectations. While it is very important to continually build awareness of our biases, this is not a sufficient strategy for improving and sustaining employees’ ability to demonstrate inclusive behaviors. When it comes to inclusion, the brain can also work for us. Within the brain, there is a complementary set of processes that can be consciously engaged to demonstrate inclusion skills. Understanding these and other brain dynamics is a key strategy for overcoming unconscious bias in the workplace. Increase and maintain high levels of self-awareness. Recognize bias and consciously re-pattern the brain’s stereotyped habits and patterns. Listen past what is already known. Avert the brain’s automatic judgments and “right vs. wrong” thinking patterns. Consistently identify shared interests and execute on shared outcomes. It is estimated that 40-50% of the decisions we make every day are unconscious, yet the competency of inclusion lies in the neocortex, where conscious thought occurs. 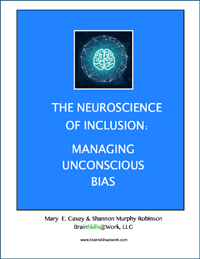 To learn more about how to override the unconscious brain and make choices based on inclusion, respect and appreciation, click www.BrainSkillsAtWork.com to download the white paper, The Neuroscience of Inclusion: Managing Unconscious Bias, by Mary E. Casey & Shannon Murphy Robinson. by Mary E. Casey & Shannon Murphy Robinson, www.BrainSkillsAtWork.com. Which of the two orange circles is larger? I’ve been able to channel my energies into what matters. Source: Paul Newby, ROLE MODELS being yourself: Sexual Orientation and the Workplace, by Stonewall. Please contact Leslie Aguilar for permission to reprint. The Ouch! Files, Vol. 6, No. 1, www.DiversityInclusionCenter.com.